We stock three sizes of single-use tamper proof bags, each available in quantities of 100 or 500. They are made from a light strong plastic and are available in clear or opaque. If the bag needs to be traced, you can use the unique identification code printed onto each bag. Each bag also comes with a tear-off receipt featuring the code for accurate recording. The outer layer features a panel that can be written on in pen or pencil. Please note it is easier to write on the tamper proof bags whilst they are empty. 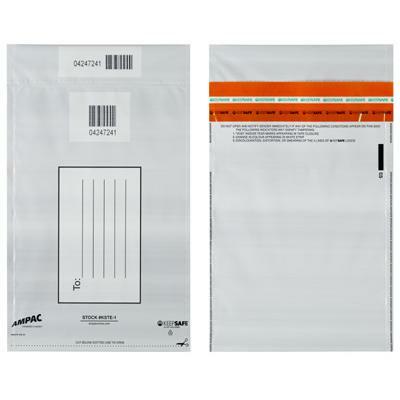 The bags display various indicators if they have been tampered with along the sealing strip. If the bags have been tampered with, they will display a ‘void’ message.